After Humans Google And Facebook Also Started Making Mistakes! Home Technology Latest Technology News After Humans Google And Facebook Also Started Making Mistakes! They told us that humans always commit mistakes, even Eve and Adam did something which was the reason for their exile from heaven. But they never said to us that Google and Facebook are also making mistakes which could let them out of the technological Eden of 21st century. After Adam and Eve Google and Facebook will become the victims of destiny! There are many security issues which are faced by these social media giants in previous years. But these are just getting worse instead of getting improved. 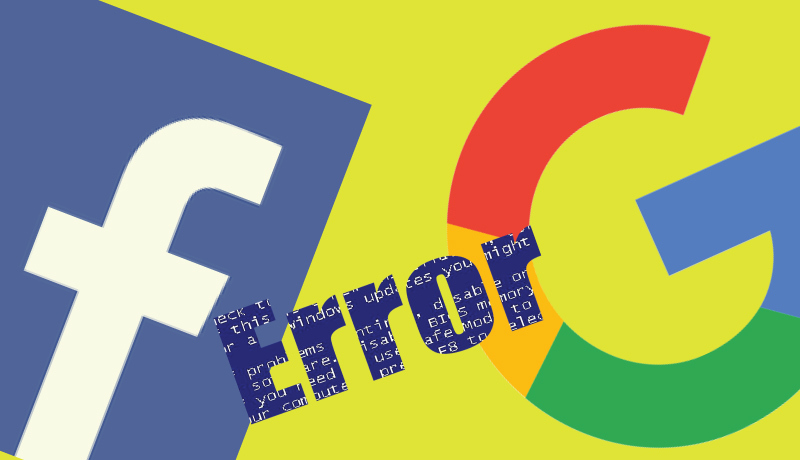 Google and Facebook both are well recognized social media and technological platforms, but the sad news is that when these platforms try to arrange and create something which is not related to their core and base they suffer security and privacy crisis. There was a report which stated that Google G+, has been disclosing the personal information of the users from 2015 to 2018. This is why G+ is shutting down this year after suffering security bug. The information leaked to the third party included the address, fax, email and contact numbers. But Google has slammed down this news by presenting a blog post stating that no issue has been reported yet, and only developers were given access to this core information. After Google suffered this and presented the clarification regarding the privacy concerned noticed by a media source. Facebook is also facing the negative comments from many people after the launch of a camera and a screen named “Portal.” This device will help you to do the video call and chat from your home so that you don’t have any issue and the video is clear. With the help of AI, you can move and connect with people over video call through Portal. Now with this, also arrived a massive range of hate from the users and media. Like, even if you accept that some doting grandparents would like to have something that does what this does in their house, why in the world would they buy it from Facebook, which has zero track record of making hardware, instead of from literally anyone else? According to the Facebook Portal vice-president Rafa Camargo, If nobody would like to buy their gadget, they will reassess. This branch of Facebook is already planning to expand and launch much more new stuff in 2019. Now the major fact is that Google and Facebook need to configure their genre and the start projects. This way they will need to define and improve their privacy and security issues more proficiently.